I have read about, and seen concept renderings for the proposed development. Though there’s much that could be said about the “performance history” of those requesting this lease, — and I do hope you have done or will do your due diligence in that respect — I will only comment here on those things I can speak to professionally, as a civil – environmental engineer having formal education/training and over thirty years of experience in these areas of science and engineering. I have also read the assurances given by the developer concerning “no harm will come” to this bay. I trust you’ve taken the time to see the videos posted on the Save Mandahl Bay website(s) showing the array of marine and terrestrial wildlife and delicate habitat, resident both within the bay and along its shorelines. There’s really no ‘nice’ way to say the following: It is an offense to credible science and everyday observations worldwide, for owners/developers and their “environmental consultants” to march before you and state that no irreparable and irreversible harm will come to these irreplaceable ecological resources. Rather, the following is axiomatic: Water runs downhill. And storm water, in the volumes occurring from even a single significant rainfall of the many such events that happen each year in the VI, cannot be treated through any cost-effective or feasible method so as to remove the myriad of pollutants from paved and impervious surfaces associated with such a shoreline development (including added heat from paving and rooftops, which alters the aquatic ecosystem). If anyone suggests differently, they are either sorely uninformed on these realities, or they are misrepresenting the truth. And if anyone claims that adverse impacts have been avoided or mitigated for other such developments, I challenge them to provide us all with truly comparable examples, in both character of pre-existing environmental / marine settings and resources, and comparable post-development conditions. Worldwide, and despite even at times the highest levels of care in trying to avoid such impacts, history has shown us that same reality, again and again: Storm water runoff carries with it pollutants that are in its path. We cannot cost-effectively capture all of that water and retain it long enough to remove the vast array of pollutants which, either quickly or over time, harm these critically important species and shoreline marine habitats. Even with the limited development currently in place that drains to the salt pond, there are definite signs that more measures are needed to better protect and simulate the natural conditions essential to preserving the pond and bay. An example of those impacts can be seen from the sky in the photo below, with red lines showing the contributing paths to that impacted area on the second photo. Significant algal growth can be seen in the upper corner of the pond, where storm water runoff drains into the pond from the hillside above, absent the needed time, distance and dense vegetation to distribute and assimilate those nutrients and other pollutants. Some may try to tell you that, the algae and any other impacts we see today arejust from “failing wastewater systems”. 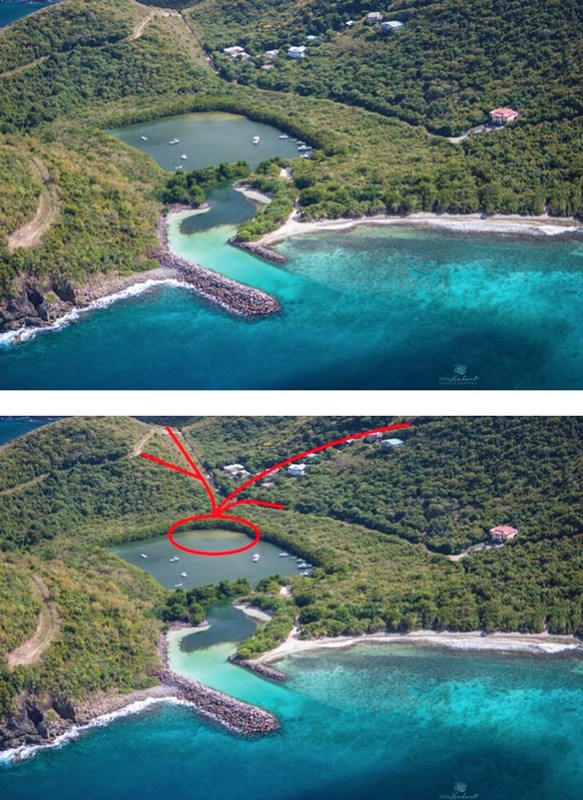 While indeed, the inferior de-centralized wastewater practices common to the VI aren’t helping matters for Mandahl Bay (or any other shoreline in the territory), they are far from the only source of problems we see evident in these photos. Even using the soundest of wastewater treatment methods, paved surfaces and rooftops, roads (paved or unpaved), and in general, removal of naturalvegetation needed to filter stormwater and slow water as it cascades down the hillside, damages and forever changes these receiving waters and bays. Those natural processes are essential for removing nitrogen and pollutants carried down even with rainfall, before they reach the pond and bay. So even today, with development as light as it is in this area, there is need for more to be done to restore those natural conditions that are critical to the health and survival of this rich and unique ecosystem. If Governor Mapp chooses to send you this proposed lease agreement, please do the right thing Senators, and vote down this proposed lease. Please do so for those you represent now, and for future generations. Development can move forward in far less delicate and vulnerable settings. And going forward, even in those locations having far less potential for damage, our near shore developments should be planned and required to happen in such a way that reflects and honors a culture and government that actually care about the treasured resources surrounding our shores. I welcome any questions you may have concerning the above statements and comments.